The 78 World Cup received a lot less tourists than the dictatorship was expecting, for which it’d given millionaire credits to businessmen. The Bauen case. “According to the sold tickets, 20 thousand people will arrive at the country”. Halfway through April 1978, less than two years from the begging of the World Cup, the words of the 1978 World Cup Autarchic Entity (Ente Autárquico Mundial 78, EAM)’s vice-president, rear admiral Carlos Lacoste, demonstrated the trust that the civic-military dictatorship put on the success the organisation of the FIFA tournament would have as a propaganda card to validate the coup internationally; and tourism was the proof the perpetrators intended to show as part of the “normality” in which Argentina was functioning, while the allegations of terror politics and forced disappearances were increasing. To develop this model of the “thriving” country, the EAM 78 handed juicy credits to hotel businessmen so that they could build four and five star buildings. The façade would fall due to the meagre concurrence of tourists, but one family would emerge as a synthesis of those excessive expenses and would build a business network starting from a building made in the centre of Buenos Aires City: the Bauen hotel. The supposed enthusiasm of the foreign tourists to come to a country governed by the military regime would quickly crumble. The 20 thousand people awaited by Lacoste already signified a cut down from the 50 thousand some national media, mounted on the dictatorial propaganda were advertising, and a step back from the EAM’s president himself, who a couple days before had put an arbitrary limit to the visits: “The capacity of the River Plate stadium was tourism’s limiting factor and that’s why only 30 thousand seats will be sold abroad”, pointed out a chronicle from La Nación on April 11th. This same chronicle signed from Madrid, Spain, was already lapidary regarding the intention of visiting the country of the dictatorship: “After passing through Paris and doing there, same as in this city, a quick tour of the tourist agencies, we feel obliged to ask ourselves a new question: Will anyone from Europe even go?”. The chronicle put emphasis on the high prices of the tourist packs, tickets included, and pointed out that someone who wanted to attend both phases of the World Cup would have to pay 4000 dollars to stay on a third category hotel. The prices were also under the EAM 78’s control. The entity had created a travel and tourism agency called “Unión 78”, which imposed prices and indicated in which hotels to put the visitors. 15 days from the beginning of the 78 World Cup, the envoy of the Spanish newspaper El País, Julián García Candau sentenced the dictatorship’s success at summoning foreign visitors. “The Argentine World Cup, from a tourist point of view, has been a failure”. The same article quoted the official numbers of Union 78, registered at the beginning of the tournament: 6,984 foreign tourists. 2000 of them came from the neighbouring Brazilian dictatorship, while 750 Spaniards were the biggest European affluence. The Dutch, which would reach the final against Argentina, added 80 tourists to the score. At the end of the tournament, the president of the Argentine Federation of Hotels, Antonio Gómez, proposed the number of 15 thousand visitors, more optimistic than the official one, but recognized that “expectations weren’t met and there was space to spare”, which he blamed on “the foreign distortion campaign” considering that “in very few cities of the world you can go out with such freedom at any hour”. The exaggerated dictatorial expectations were exposed as well on the empty hotels. The numbers of the Union 78 entity indicated that in Buenos Aires there were 14805 vacancies, but only 1797 of them were occupied. In Mendoza, 1406 out of 4738 had been occupied, and in Rosario 766 out of 3055. However, by then, the EAM 78 had already given via the National Bank of Development (Banco Nacional de Desarrollo, Banade) 2 billion pesos ley (official currency at the time) of the National Treasure, in credits at a very low return rate, so that 800 new rooms could be built in Buenos Aires, 100 in Mendoza and 100 in Rosario. The plan was presented in August 1976, a day before the murder of Oscar Actis, first president of the EAM 78, supporter of a more frugal organisation. In 1976, Marcelo Iurcovich founded Bauen S.A., and his “contacts with rear admiral Carlos Alberto Lacoste, president of the EAM 78, and brigadier Osvaldo Cacciatore, Buenos Aires City comptroller, allowed him access to Banade bank’s credit”, holds journalist Santiago O’Donnell in an investigation published by Página/12. In July, the Military Junta declared the 78 World Cup of “national interest” and sheltered the EAM 78’s costs under that regime. On September 30th of that same year, the project presented by Iorcovich was approved, and on November 18th the loan for the construction and equipment of the hotel was signed, with a return date for April 30th 1978. According to O’Donell, Iorcovich bragged in private about having built a hotel with 20 floors, 200 rooms, 7 salons, a pool, a restaurant and a commercial shop in the porteño centre (Callao 360) without having to put any money in it. 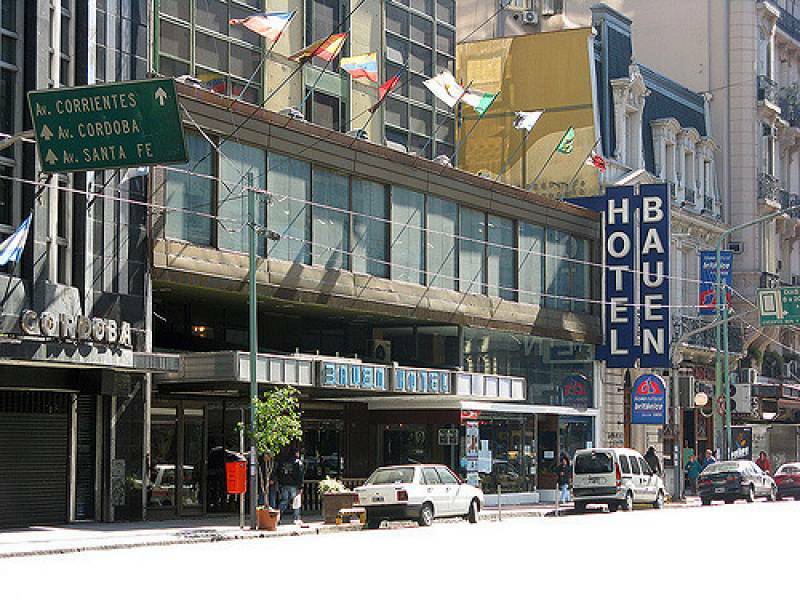 The hotel was built in record time under the direction of Poliequipos CIIMS SA, a company of the Iorcovich family’s, and in May 1978 it joined the 4700 first category hotels already existing in Buenos Aires, according to the Hotels and Similar establishments House. “We were very happy with the World Cup without knowing what was happening around us”, remembers Arminda Palacios in the book Bauen, el hotel de los trabajadores (2017). Arminda was one of the workers hired by the Iurcovich family before the inauguration in 1978 and one of the 30 who, in March 2003, dared to seize the hotel after the declaration of bankruptcy and the 2001 firings, which had left everyone on the street. Thing is, once the World Cup fever was over, the Iurvocich family continued exploiting the hotel up until 1997, when they agreed on a suspicious sell to the Chilean businessman Félix Solari, who decreed bankruptcy in 2001 and left all the workers on the streets. They, with the backing of the Recovered Enterprises Movement, founded the Work Cooperative Buenos Aires A National Enterprise (Bauen) so as to reopen the building and recover their jobs. By then, the founding family had re-bought the hotel under a new denomination: Mercoteles. And they never stopped seeking legal action to evict the workers. The manoeuvres of the “Iurcovich group”, which extended its business with hotels abroad and offshore accounts, kept their original sin: the enrichment from that dictatorial loan they never paid. “The company started a new lawsuit against the State at the beginning of the 80s, on grounds of supposed damage caused by the delay in Banade’s payments, with the sole intent of turning the loan into a judicial conflict and avoid paying it. The trial ended only in 2007, and beyond the whole argumentation to demonstrate they had been defrauded, what’s true is they never actually did pay for the loan”, summarizes Federico Tonarelli, vice-president of the Bauen cooperative. That 2007 ruling point out that, although recognizing a fee for the delay in payment of the state bank, the “Iurcovich group” owed, up to 1991 only, 8 million pesos to the State. A previous report by the National Direction of Patrimonial Normalization had indicated that BAUEN SA’s debts went up to 85,476,985 million pesos. The cooperative carried out an investigation of their own, in which they determined that the debt rose, in 2012, with the capital update, to 122,569,752 pesos. The Iurcovich family’s debt with the State, that they managed to liquefy through their long judicial strategy, was one of the cooperative society’s arguments to demand an expropriation law from the National Congress to retrieve that patrimony built with public funds and give it on loan to the workers, who since 2003 reclaimed the building and 130 jobs. Another of the arguments of the reclaim were the years in which the cooperative got the Bauen working again. On the first ten, they reinvested 6 million pesos in fixing it up. The hotel became an international reference of self-managed work and a mirror of the kind of grassroots organisation that the dictatorship’s plan intended to erase. That’s why, in 2012, they renamed the hotel’s main auditory “Abuelas de Plaza de Mayo”. “The men and women who carried through this miracle in this hotel are the ones who fight for the same ideal that the 30 thousand disappeared had”, claimed the titular of Abuelas, Estela De Carlotto, on the day of the auditory’s rebaptism. In spite of the millions in debt sustained by the Iurcovich group, and the building’s reclaiming, the jobs, and the cultural and social activity generated by the cooperative, who resisted many attempts of eviction, the Supreme Court recognized the property of the building to the founding owners. Then, the arguments would be repeated in Congress: “These promotion credits were destined for a few businessmen linked to the hotel industry, who showed off their influences with the dictatorial government”, said the expropriation law project, which proposed that the State paid the value of the property after measuring the building’s value with the accumulated debt, and handed a right in use in favour of the workers. The Parliament approved it only in November 30th 2016. Less than a month afterwards, president Mauricio Macri vetoed the law, favouring the Iurcovich family and opening once again the possibility of the worker’s eviction. The presidential arguments pointed out that it would be “in benefit of a particular situation that only affects a group of people”. “What’s built for the ‘78 remains for after the ‘78” remarked the military dictatorship’s official propaganda. It never clarified for whom.